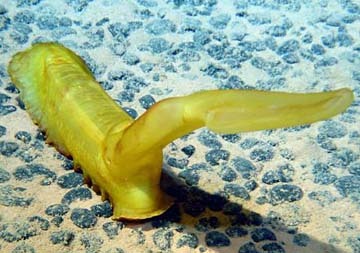 Shown above is a newly discovered deep-sea animal from the Census of Diversity of Marine Life program in the South Atlantic. 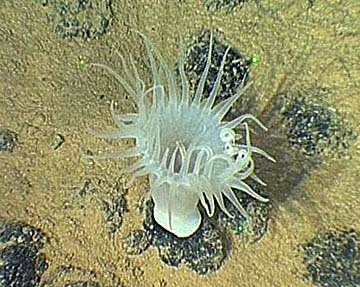 Many deep-sea areas may need protection to preserve ecosystems and creatures being seen for the first time, says University of Hawaii oceanographer Craig Smith. "Ninety percent of species we collected are new to science," he said, describing expeditions to collect data for the design of marine protected areas in what's called the "abyss" -- the deepest part of the ocean. Trawl fisheries already are damaging seamount ecosystems and potential deep-sea mining is a major threat to deep-ocean species, he said. He and his colleagues will meet in October to recommend protections to the International Seabed Authority for ocean resources. This shows an anemone on a manganese nodule. Surprisingly diverse and novel creatures inhabit the deepest part of the ocean, known as the "abyss," University of Hawaii oceanographer Craig Smith and his collaborators have discovered. "The abyss is poorly appreciated," said Smith, who is investigating ecosystems of seamounts and abyssal plains to design marine protected areas in the Pacific. "The number of undescribed species is just astounding," he said in an interview. "Ninety percent of species we collected are new to science. "There are so many new species, we don't have the manpower to describe them," he said. "But they are poorly explored. No collections have been made in huge parts of the South Pacific." Smith began a Census of Diversity of Marine Life in 2004 with a colleague in Germany and also received a prestigious three-year Pew Marine Conservation Fellowship that year for research and design of marine protected areas. 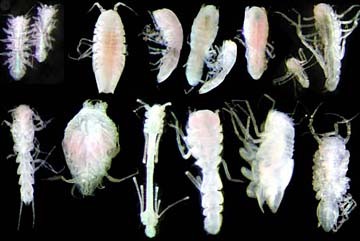 Shown here are 10 of the 750 new species of crustaceans collected in a single South Atlantic region by the Census of Diversity of Marine Life program. The distribution of many kinds of animals is much more restricted than suspected, Smith said. "They tend to have smaller ranges, which increases the possibility of extinction from human activity." Thus, many marine protected areas probably are needed to prevent species extinction, he said. "We can't just protect one part of the ocean and presume it will serve as a reserve for abyssal species throughout the world." 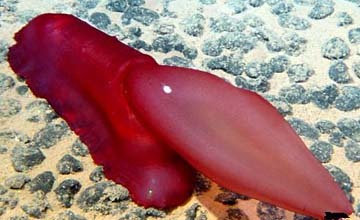 Trawl fisheries already have caused significant damage to seamount ecosystems and biodiversity and potential deep-sea mining is a major concern, Smith said. And he said he wouldn't be surprised if manganese nodule mining occurs within 10 years, which makes his mission urgent to protect marine life and ecosystems in the deep ocean. Smith is working on the Pew Fellowship project with Australian Tony Koslow, a world authority on seamount diversity, now at the Scripps Institution of Oceanography. Koslow also is involved in a seamount census as part of a 10-year, $1 billion Census of Marine Life that began in 2000. "Even the United Nations almost passed a resolution to ban trawling in the high seas the past year" because of the damage occurring to seamounts, Smith said. "It was a close vote, but didn't pass. So there is international recognition that something needs to be done in international waters for bottom trawling." Mining of sea-floor nodules also is "getting closer and closer" with rising prices of metals because of the demands of economies like China and India, he said. Smith is working with the International Seabed Authority, which has jurisdiction over mineral resources in the ocean, to design protected areas for the ocean's mineral resources. The scientists have mounted many expeditions to different parts of the Pacific to collect data. The Pew fellowship is in its final year and Smith said he and Koslow are trying to pull together different sets of data to get a better understanding of the diversity and distribution of species on the seamounts and abyssal plains. The census project continues through 2010, with $300,000 a year in federal funding to UH for the program, he said. He is planning a workshop in October, either here or in San Diego, for all the scientists working to design protected ocean areas. They will summarize what they know and come up with recommendations to the International Seabed Authority for protections in the face of seabed mining, he said. "One of the underlying principles of ecosystem-based management is the ecosystems are connected," Smith noted. "If we set up, for example, a marine protected area to protect biodiversity from mining and someone comes in and destroys the whole ecosystem with trawl fishing, it defeats the purpose. ... We need to be broad in the kinds of activities we regulate in setting up protected areas."